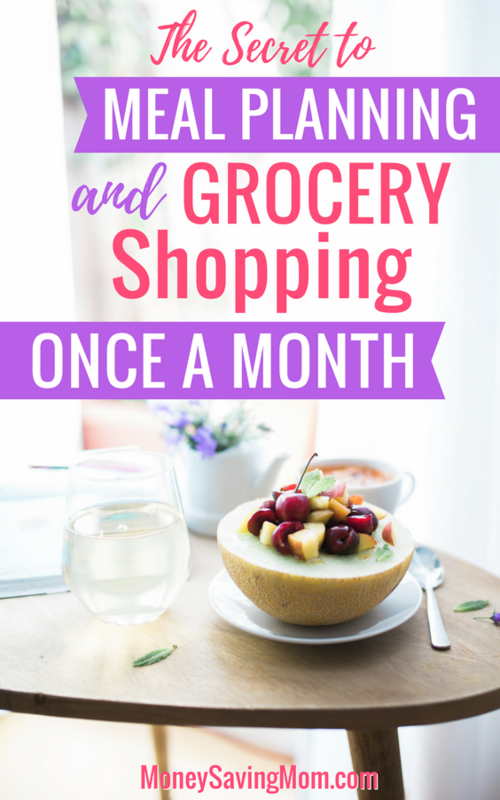 I’ve recently grown to love meal planning and grocery shopping for the whole month at once… and while that might seem overwhelming to some of you, today, I’d like to share a few tips for those of you interested in giving it a try! I would highly suggest finding a LOCAL blogger who lists all the local grocery ad’s sale prices each week. .
Every month, I sit down with my family calendar (already filled in for the month) and a blank meal planning calendar. MSM has several free meal planning calendars, and . As I’m planning meals we want to eat, I check our family’s calendar. 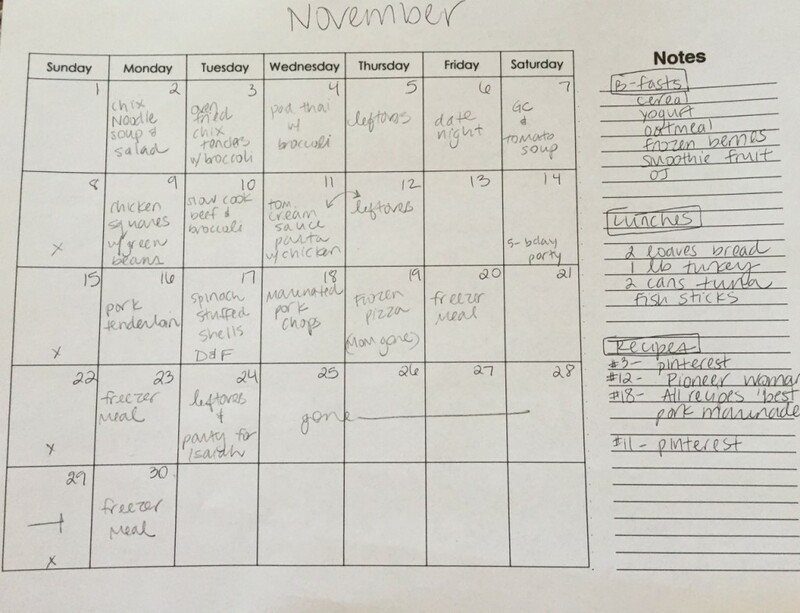 Meal planning with my family planner on hand has saved us a lot of wasted food! In fact, over the past few months, I’ve realized I really only need to cook about 3 times per week. Between other things going on, family dinners one night a week, and leftovers, we just don’t need 6 or 7 meals per week. Planning meals around our calendar saves time (no more last-minute store runs) and saves money (no more buying for meals you won’t end up making or eating)! I used to buy a large container of chicken broth or can of tomato sauce only to end up needing a small amount of it for a recipe. Then what? I’d forget about it, find it in the fridge weeks later, and throw it away. I really like for finding recipes from what you have in your pantry or already on your grocery list. This is the stuff that you don’t really plan for, but you eat. Milk, cheese, nuts, baking ingredients, snack food, toiletries, and paper products to name a few. I just inventory our pantry and think through these things at the beginning of the month. We also eat a lot of cheese. I buy 8-10 packages at the beginning of the month. My husband and I both like to snack on Trail Mix as an alternative to junk food. I buy several boxes of whatever cereal is on sale the week I go — we probably go through a box or two per week. Sometimes, I just don’t buy it so we’re forced to eat healthier and cheaper breakfast options like oatmeal, eggs, or parfaits. I also check the toilet paper, baby wipes, diapers, toothpaste, laundry detergent, etc. Whether your list has 9 categories or 2, organizing your list (approximately) by what’s close to each other in the store lowers the chances that you’ll be running back and forth trying to find what you forgot. Take it from someone who’s been there, done that, oh so many times! One time, I attempted 20 freezer meals at once and hated it, but I do like having meals in the freezer for nights I don’t feel like cooking, or if a friend needs a meal last minute. So every month, I put a couple of meals on the menu that are easy to double and freeze. I always mark those meals “D&F” so I remember to double it and to buy double the ingredients at the beginning of the month. I never take my kids with me on a once-a-month trip — it just takes too long! I brought them once. Huge mistake. I’m still recovering. But, if, in a momentary lapse of judgment, you decide to attempt this monthly grocery trip with your children, bring them snacks, and plan for a treat at the end for good cooperating. I’ve grown to really prefer once-a-month shopping. I love not having to fit a grocery store trip in with my kiddos every week. If you’re not sure, ease into the crazy and try two weeks at a time. Good luck! Renee Cook is a former music teacher turned stay-at-home mom blogger. She loves her family, other people & coffee. She writes on , about babies, budgeting, grace and everything in between. Enjoyed reading this, I do this also but for 6-8 weeks at a time. I save so much money and it really works! How often do you do produce runs? Every 7-10 days depending on the season… fruit that’s in season in the summer (berries mainly) goes bad faster than fruit that’s in season fall & winter (apples & citrus). Also, I buy salad ingredients and a variety of green veggies for dinner and we eat the stuff that is more likely to go bad first. So, salad the first couple nights, then green beans, then broccoli for example. 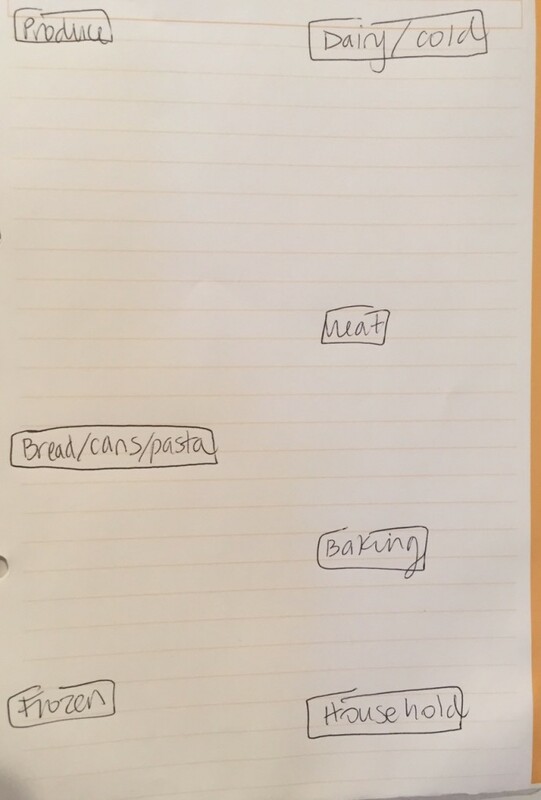 I keep a blank grocery list of the things we usually buy on an excel spreadsheet. It is organized by aisle/section of the grocery store with items in each area listed alphabetically. Each time I go for a major trip, I take inventory with my list and just highlight the items I need. I totally agree about the 4:00 question. I love not having to think about it!! This is my second month of shopping once a month & I love it. It’s been such a time saver so far!! I freeze any left over pasta sauce, broth, etc. I’m also freezing any produce that would have otherwise gone bad by the end of the month. I soak all of my fruit in vinegar-water. 50/50. That really helps prevent early spoilage. ooo interesting! how long do you soak for? and then you freeze completely dry right? I’m not Kim, but we blanch and freeze – i.e. boil fresh produce for 1-2 minutes depending on the vegetables and then freeze. We then cook them as needed the same as store-bought frozen vegetables. This is the same process that is used for store-bought frozen vegetables so if you like those, you should like the frozen ones too. We don’t freeze salad greens except chard and spinach. To freeze fruit, we slice and place on a baking sheet in the freezer (so we don’t end up with a sticky lump) and then place them in freezer bags when they are frozen. These do end up “soggy” so I use them in baking and smoothies rather than eating them straight up. I blanch & freeze the produce that would otherwise go bad, like Lea mentioned I don’t use it as I would the fresh, but it works great in soups, pasta dishes, . I partially thaw the frozen veggies I put in soups (the veggie water has nutrients too) & throw it in the soup. I do thaw & drain veggies (except tomatoes) that I use in casseroles. Frozen vegetables usually have a shorter cooking time than fresh. Last month I was given a bunch of salad greens twice within 2 days of each other. Some of them did go bad because there was just so much. We ate/cooked a bunch of it fresh. I blanched the rest for 1 minute before I’d lose it, dumped it in ice water to stop the cooking process, & froze it in ziplocks. I’ll use it in pasta (spinach/kale lasagne, other pasta dishes), potato soup, minestrone soup, &/or other soups. I’ve never heard of it, but I’ve even frozen lettuce & used it in soups. Pretty much anything you see in the frozen aisle at the grocery store can be frozen. You can google how to blanch vegetables or how to blanch corn, etc., to find out how long for that specific vegetable. Frozen vegetables have less nutritional value than fresh, but more than canned. You can also freeze the vegetable cooking water to be used in soups. I freeze milk (for baking), cottage cheese (for lasagne, pasta), fruit (for smoothies, sauces, pancakes) & yogurt (for strogonoff, smoothies) too. The consistency changes, but the taste is still good. You freeze cottage cheese?????? That’s amazing. That is the one thing that I HAVE to run to the store for whenever I want to make lasagna. Ugh, hate that! You’re very welcome! I just started doing that when I stocked up “too much.” It changes the texture, but works in pastas for us. You might want to try a small amount first, to see if you like it. Hi. I have a question. For years I did grocery shopping for two weeks at a time, but I was finding that on my off weeks sometimes the store would be having great sales on their loss leaders but I had already spent my money for those two weeks. In recent months we’ve switched to shopping every week (with cash! Thanks Crystal. This has been a huge help for us) so that I can take advantage of the weekly sales. Do you find that you save enough money shopping monthly that you don’t miss being able to buy things when they’re at their lowest price on a week when you’re not shopping? Hope that makes sense! Totally makes sense. And yes, our grocery budget is very similar to when I bought things at their ultimate low and “stocked up.” If something that doesn’t go on sale often is ridiculously low (i.e. 85/15 ground beef or a certain cut of red meat), I’ll sometimes grab it when I do a quick produce run. I make sure not to spend more than 1/2 of the budget in the big trip. 🙂 Having 50% of our budget left is good for produce runs, misc. household products (light bulbs, diaper wipes, whatever), or if I decide to do last minute freezer meals for someone or bring a dessert/ potluck item to something that came up last minute. Hope that helps! Yes to all of this! Been doing this for over a year now and I can’t imagine going back to my old ways. I have no idea how I even functioned without my menu plan! I typed up a list of menu ideas (aka stuff I know my family will eat) and throw in a few new recipes here and there for each menu! I usually do 6-8 weeks picking up milk and eggs in-between (we use ALL fresh produce in the beginning and use frozen or canned for the rest, we plan on tacos, BLT’s, Salads, etc. the very first week of each menu rotation). Such a cheap way to live, and we always have food ready to be prepped that night! My friends make fun of me and my love of my freezer, but I’m the one that doesn’t have to stress about what to make for dinner, saves major coin on our food budget, and has virtually no waste! Lol! My friends make fun of me too 🙂 Totally on the same page as you! I’m just teasing because I still feel shell-shocked by how much my teens eat. Everyone always says they eat out of house and home but I really thought people were exaggerating. Now I know better! But this is an awesome article! So many practical tips. I’ve been trying to figure out how to make a monthly run to Costco work for us, and this helps a lot. Thanks! I like to shop weekly as the ads change, but this article was fantastic! Very detailed and helpful for someone not used to the process. I’m enjoy reading these ideas. 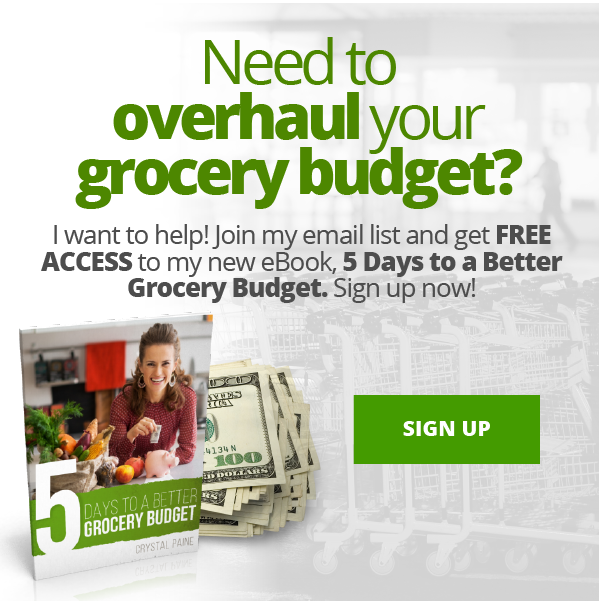 If you don’t mind me asking, about how much is your grocery budget each month? Check your local Walmart to see if they offer the store pick up option. You don’t even have to get out of the car! I love it!! My biggest issue is that we have such a small budget and such a large family. We tend not to have leftovers and with a house of teens and athletes it makes it that much harder to keep food in the house. I have been grocery shopping once a month, since my husband passed away 8 years ago.i buy double what i can like bread and buns and freeze some of it until i needed it. Make soup every week and freeze some for the next week or months. I can fresh food from my garden and some months i only need a few items and the necessities from the grocery store. I grow my own herbs and dry them for the winter too. I save the bones from chicken,beef and turkey and make and can my own broth. Homemade broth is so good in homemade soups. I make a menu for two weeks and let it repeat for the next two weeks. This goes on for 3 months (holidays, birthdays, etc. help keep it interesting). I shop at ALDI every two weeks; when I need more fresh items or something ALDI doesn’t carry, I go to Food Lion which is just 5 minutes away. During the months of December through February I plan more Paleo type meals because of the huge amount of sugar and flour available to us because of Christmas and two birthdays. In the spring I plan on more lighter fair. Summer is more loosely structured due to our more carefree schedule (my hubs is a school teacher), and we have our own garden and shop the farmers market more frequently. I usually shop weekly, but I find that if I have my menu planned for the month that it saves me money to buy ahead for the month. Rather than waste some of the extra money I might have for the week on snacks or something. I should try shopping every 2 weeks.